On November 30 is Remembrance Day for Lost Species. On this day we remember – in public or private, quietly or through a community celebration – those animal species that no longer inhabit this Earth, and also to find out what we can do to protect those fellow creatures who we currently share a planet with. Marking the day has a special significance to me this year, as I’ve recently become a mother – the most extraordinary of ordinary experiences. To grow a tiny person and nurture her with my body’s own milk was the most visceral reminder of my own mammalian nature and place in the wider biotic community. With its initiation rituals of bodily fluids, I also joined the community of parents. A world of stuff – a constant flow of objects we’re supposed to need passes through our homes, adaptating to the developmental stages of the growing child and those of the eager parents. There’s maternity stuff, birth stuff, newborn stuff and baby stuff in countless shapes and sizes, and of course books and toys. Having children in an industrial nation puts a huge pressure on the newly forged parent to consume more. Thankfully the parental hand-me-down network is well oiled, and one perk of living in a city is the proximity to charity shops that regulate the flow of second hand baby equipment between families. We hardly bought anything new. It turns out that kids stuff is covered in representations of animals; endangered flagship and keystone species seem to be particularly popular. My daughter’s bibs and babygrows are full of bears, wolves, elephants, zebras, dodos, giraffes, lions, penguins and monkeys. And we haven’t even gotten started on kids entertainment, books and toys. I’ve even seen a massive bouncy chair which was supposed to create an immersive rainforest experience for the child, complete with spinning animal mobiles and sounds. What amount of resources, measured in rainforest equivalent, had been used to make that thing? The animal-rich world we offer our children stands in stark contrast with ‘respectable’ adult stuff which rarely features animals. Adults don’t surround themselves with representations of animals – adults kill them instead. As it emerges that 60% of population sizes of wildlife have been wiped out since 1970 by human practices – or capitalism and oligarchies, to be more specific – we can truly say that children born these days witness the sixth global mass extinction. As the details of how we wipe out the ecosystems we depend on alongside their inhabitants can be overwhelming, Remembrance Days for Lost Species focuses on ine particular species per year. 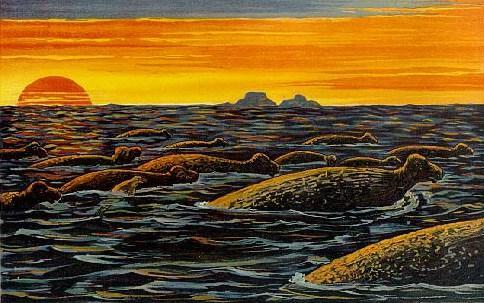 This year, we remember Steller’s Sea Cow, a large marine mammal, to mark the extinction and endangerment of marine mammals and also the ongoing threats to seas: “Steller’s sea cow was last seen in 1768 in the Bering Sea between Alaska and Russia, just a few years after it was first observed and named by Europeans. 2018 marks the 250th anniversary of its extinction”. My daughter’s middle name is Auk – not only after the extinct Great Auk, but also so she knows and connects with the seabird colonies off the Scottish west coast, many of whom are auks – among them guillemots, auklets, puffins and razorbills. Their colonies are now severely threatened by climate change, with stark declines in numbers already recorded. So this year and from now on every year on November 30, I will remember together with my daughter how important it is to know, appreciate and look after our fellow creatures, say their names with reverence, and gather with our friends and in our communities. Moving beyond stuff and pets, the only meaningful way to love animals these days is to find our place in the wider biotic community once again with humility and awe. In all the WW1 commemorations, I hardly found any coverage of the harm to animals, apart from the usual stories of war horses and medal-winning carrier pigeons. I believe whole forests (and presumably their inhabitants) were destroyed in France. Oil slicks from sinking sea vessels caused significant harm to marine life, I gather. Are there environmental audits of wars? Do weapons systems have to be evaluated for their harm to the natural world? A nuclear war of any size could wipe out species on an unprecedented scale. What gives people the right to do that? How do we balance human population growth with protecting animals that might (in some parent’s fears, at least) eat their children? That’s pretty much the opposition I hear to rewilding large predators, and if it’s not children, it’s livestock that farmers want to protect (or in Scotland gamekeepers and game). Ultimately, you’re faced with encouraging children to grow up to have less children of their own. Animal toys preferable to dolls then, I suppose. Absolutely re ecological devastation of war. And animal toys for children are wonderful (if made from renewable resources and passed on between children)! I just wish we didn’t ask them, on a cultural level, to “grow out of it”. @ Svenja, the NYTimes article raised the issue of the missing research, such as studies “showing the effect of pesticide spraying on the quantity of insects living in nearby forests”. Signs of the apocalypse have been all around us, in a massive but gradual ecocide (gradual to a human life, shockingly abrupt to ecosystems). It was also sobering to think that some vital scientific records might have been destroyed by city-bombing during war. What should our duties to the natural world be? In season 2 of National Geographic’s Mars drama+documentary, scientific search for life on the red planet comes up against corporate greed, a microcosm of what is happening back on Earth. It is interesting in how they frame ‘balance’ here, as a conflict between ideologies. But only one ideology is rooted in science and human experience, the other involves unnatural fantasies of riches without reason, understanding or consequence. Taing for this moving & informative article Svenja. Despite being someone who passionately hopes and works for an independent Scotland on a daily basis, i would have no issues with sacrificing a St Andrew’s Celebration for a Remembrance of Species Lost going forward on 30th November. Hopefully we will learn as a human species to recognize “our place in the family of things”. In the independent scottish republic of my dreams that would go without saying.